As many of you know I have been a big fan of Slippery Pig Brewing Company since its opening last year. And just when I think “the Pig” can’t do any better, they continue to surprise me! On a recent visit I noticed some great enhancements to the tasting area and got the chance to try some of Dave’s new creations. 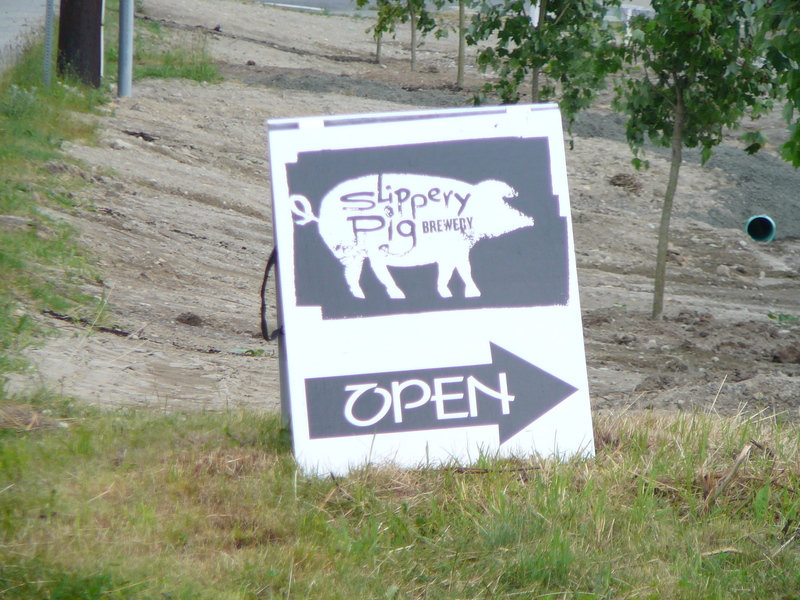 The first physical enhancement of note is that the dirt road the brewery sits on has now been renamed “Slippery Pig Way.” This makes the brewery MUCH easier to find for the first timer and is a great nod to the efforts put forth by Slippery Pig’s owners: Dave and Shawna Lambert. After all, not everyone gets a street named after them! The tasting area has had a facelift as well. Still located on the farm the tasting area is now covered with reclaimed beams from the Alamo Theater that was once located in old Poulsbo. Now during any PNW weather we can sit and enjoy a pint. Do you like scavenger hunts? Ask for a list of the “recycled” objects in the tasting area that highlights the farm and Lambert family history. Oh! And they have pigs! Western Red Cedar Lager (6.4% ABV) – This crazy good beer has the most unusual of ingredients…Western Red Cedar tips. You read correctly. Three pounds of them are added at the end of the boil and steeped like tea giving a surprisingly beautiful, spicy flavor. The cedar is definitely present in the aroma and has a sweetness that tastes like it belongs there. I couldn’t get enough of this beer… and neither could the other customers! Hildisvini, Battle Swine (9.8% ABV) – One of the craziest beers I have ever had also has the craziest ingredients. Rhubarb, cinnamon stick, raisins, and caramelized squash just to name a few. Battle Swine is unfiltered, full-bodied, thick and syrupy. Lovely sweet, brown sugar and caramel finish. This is definitely a sipper and not for the faint of heart. Battle Swine is a great after dinner beer. Slippery Pig is also a working farm with a lot of history and character so if you haven’t visited the brewery yet it is definitely worth the trip. I’m not on Twitter but you can follow me on facebook. Thanks for looking! Cheers!